The idea for these cards (and the corresponding “God Made Me” video that Shepherd My Child is currently in the process of filming) came to me as I was trying to teach my son about his own body parts. I was struck by how “segmented” education (in general) and Bible education appeared to be for young children. Most education (for the smallest children) only consists of Bible stories, and I was really looking for something to show how God was involved in the day-to-day of everything that Shaan was learning – body parts, shapes, colors, numbers, nature, and so on. What’s great about these cards is that they can be used with your child(ren) for years. At the earliest age, you can point your baby to the pictures and simply state “God Made You,” God Made Your Eyes,” “God Made Your Ears,” etc. As the baby grows, you can start speaking the Scripture to your young one at bedtime and maybe doing one prayer each night. For instance, when my son turned one I started reciting the “Lord’s prayer” to him every evening. I wasn’t trying to get him to memorize it, I was just speaking it over him before we said “our prayers” to God. One day at church when he was 2 (before the break to take children to “children’s church”), the members were reciting the Lord’s prayer as part of the service and I was shocked when Shaan jumped right in and starting saying it too. He had practically the whole thing memorized!!! 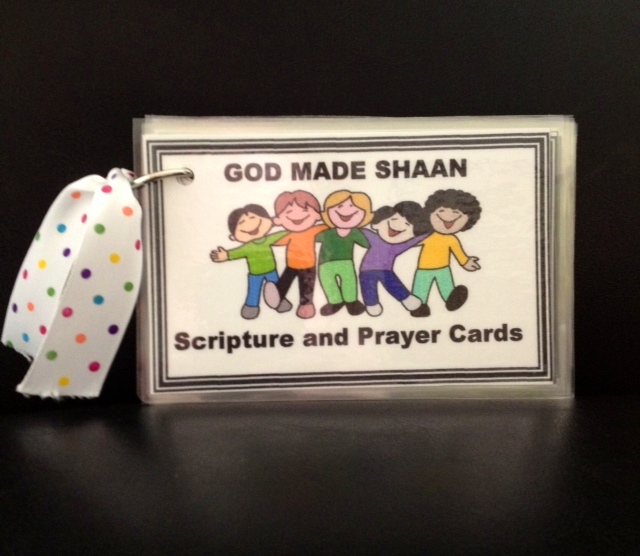 These children are little sponges and these prayer cards will help you as their caretaker to be deliberate about speaking Scripture to them in a fun way. As they get older, you can work on memorizing the verses together, and using the corresponding prayers to reinforce the meanings of the verses. I’m really excited about these cards because it makes my job a little easier. It helps me be deliberate about getting Shaan in the Word and talking to God. I’m really enjoying memorizing the Scripture with him too. As I mentioned, these cards were a labor of love. It takes quite a bit to of time to produce them – folding, pasting, cutting, laminating, cutting after lamination, etc. However, it’s great because throughout the whole “putting the cards together” process, you get a chance to pray for the young one each step of the way as you’re putting the cards together. Eventually, my plan is to offer these cards in some capacity on the Shepherd My Child website. However, I’m gearing up to be out of town for a couple of weeks, so won’t be offering them online until then. IN THE MEANTIME…since the completion of these cards marks the completion of the very first Shepherd My Child product (hooray, hooray, hooray! ), I want to give away two sets of cards at random to Shepherd My Child fans who would use these cards with their little ones. If you are interested in winning a free set (p.s. the sets can either be personalized as shown above or generic (i.e. 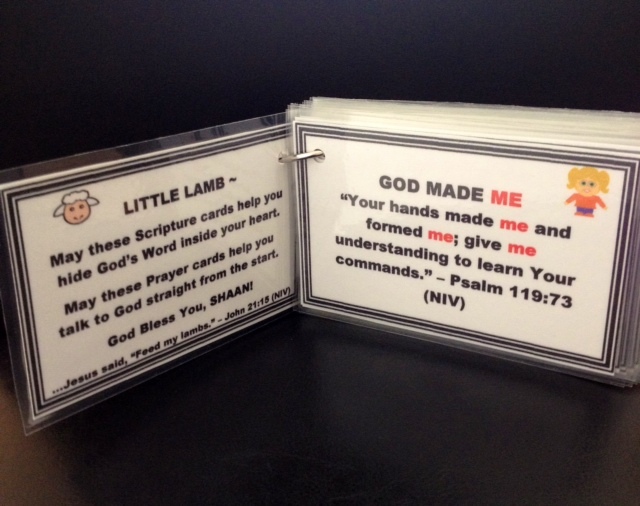 “God Made Me”) if you have multiple children and want to use the same set for all children), here’s what you need to do – simply leave me a comment on this blog post below that you are interested in a free copy of these cards. Make sure you leave your email when posting (don’t worry – your email won’t be seen by anyone besides me, I just need a way to contact you if you happen to be one of the winners). Two weeks from today (September 17th) when I’m back in town, I’ll take all the names of the commenters from today (3rd) through the 17th, place them in a hat, and draw out two names at random. Let me know if you’re interested!!! And Happy Labor Day!!! Would love to win a free set of your cards to use with my son. We would love a set for my girls! I was thrilled when I read all about this concept! I believe they would be a wonderful tool as we train our children in the way they were made and the direction God has for their life. I also hope it will challenge me to memorize more scripture as their mom!! Way to go on all your hard work Cammie! I’m thankful for the ways God is using you to resource other parents! Love ya! 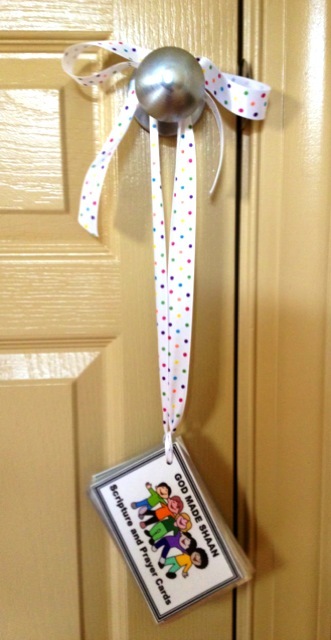 Cammie…I love this idea and my kids would love using these! I am so proud of what you have accomplished for all of us. God truly has blessed you with a wonderful gift of teaching. I also love teaching, but the ideas don’t come quite as inspirational as yours. Thanks again for sharing with all of us. Cammie, what a blessing you are, and what a Godly example for Shaan! I would love to have a set of your cards for Kelly and my 2 1/2 year old granddaughter Mckenzie. She loves prayer and worship, and she is so thirsty for God! What an awesome time to introduce these concepts! Much love to you and your family! Keep up the good work! Would love a set for my kiddos!! The cards are precious and would be a wonderful part of our nightly “special time” with Lucy. So excited to see what’s in store from your site!! Cammie, these are so wonderful!! I would love them for Ben and for Becca!! These are awesome! Please put my name in the hat! I hope Conner wins a set of cards! I love the way you incorporate spirituality into your everyday life. I am so glad to know you, and to have your inspiration to draw some cues from. What a great idea Cammie. Please enter me for a set! Love it – What an awesome idea!! Throw my name in the hat too please mam! Could use this with a couple ministries I volunteer with!!! Would love to use these with my 1 year old! Great to take for traveling or to use at home! Love the cards! What a great way to teach a child parts of the body but also include God in our teachings! I would love a set with my daughters name!!! Would love a chance to win a set! Sharing God’s love with children makes me realize what miracles He does in my life on a daily basis . i would love a set. add me to the drawing please. thanks. I would love to win some cards!! Cammie- I love these and definitely want a set for my Charlie!! Would love a chance to win these for my granddaughter. I LOVE these! and everything on your site! I am so excited I found you! I would love to order a set of these. Are they available for purchase? I would love a set, Cammie!! Cammie the cards are awesome. I would love to win a set for Reagan and Jackson! I love how creative the Lord has made you and you are using it for His glory! Our growing family would love a set of these cards! Love these Cammie! U r such an awesome mom and I love how God is using shepherd my child to help other mamas better parent thieir kids to god’s glory and for their benefit!! Keep up the good work… Hoping I win a free one for Easton! love u! Since I am past the date to win the sets, would it be possible to purchase a set? These are so cute, and I would love to have them for my kids!